Patients with deformity of the proximal femur typically develop arthritis over time because of abnormal joint wear from malalignment. Deformities typically include a varus or valgus neck-shaft angle, rotational malalignments, and leg-length discrepancy in any combination. These deformities can be acquired, as in the case of proximal femur fracture malunions and nonunions, or developmental, as in the cases of fibrous dysplasia, coxa vara, and developmental dysplasia. Regardless of the etiology, these patients with femoral deformity are at an increased risk for the development of pain and arthritis in the affected hip. 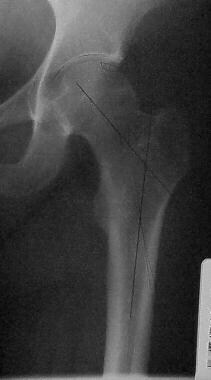 Once arthritis has begun, the problem is further aggravated by the mechanical malalignment from the femoral deformity. Standard hip replacement techniques and prostheses are usually unsuitable for deformed proximal femora, thus increasing the complexity of the procedure, surgical risks, and possibly the longevity of the reconstructed joint. 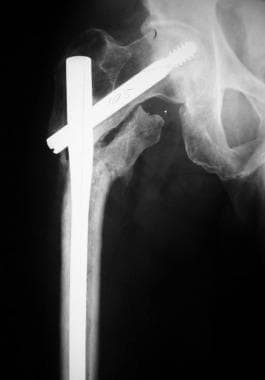 Proximal femoral osteotomy was a technique used in adults in the early part of the 20th century for the treatment of hip dysplasia and osteoarthritis. Varus- and valgus-producing osteotomies were aimed at maximizing joint congruity and redistributing the weightbearing load across the femoral head to a less affected area. Historically, the best results were obtained in patients with long-standing deformities, including Perthes osteonecrosis, coxa vara,  and developmental dysplasia. The benefits of early proximal femoral osteotomy to correct the deformity are twofold. First, in the deformed hip prior to the onset of arthritic changes, the realignment often reduces symptoms and prevents further joint degeneration. 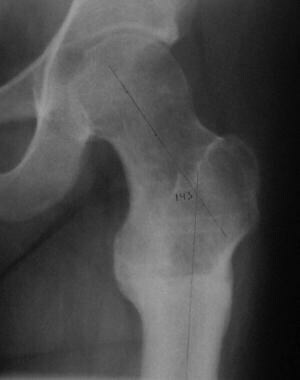 In the deformed hip with arthritic changes, restoration of normal alignment can often decreases pain and improves function. Moreover, if the relief of symptoms is incomplete and the patient later requires hip replacement surgery, then the arthroplasty procedure is simplified by restoration of the anatomy. In young patients with symptomatic hip disease, total joint arthroplasty has traditionally been a suboptimal solution. Problems with accelerated bearing wear and premature implant loosening leading to early revision surgery are well documented in this patient population. Intertrochanteric osteotomy has some use in providing temporary relief of pain in this challenging group of patients. Whereas newer bearing materials with improved wear properties may improve the longevity of total joints in young patients, data to support this position are yet lacking. This severe vertical fracture line through the femoral neck is a high risk for nonunion with simple pinning fixation. The fracture is stabilized with a screw, and then a 95° blade is inserted. Proximal femoral osteotomy is created and a wedge removed. Final image showing a valgus-producing osteotomy with improved orientation of the femoral neck fracture. 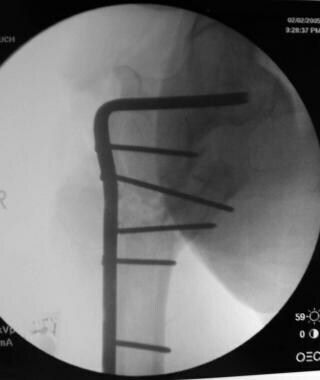 Painful nonunion of a peritrochanteric fracture in varus position with shortening and broken hardware. Repair of nonunion with a 95° blade plate with restoration of normal alignment and equalization of limb length. When the fracture collapses into varus angulation and then goes on to bony union, a malunion results. The hallmark of this malunion is a varus neck-shaft angle with shortening of the ipsilateral femur, shortening of the abductor musculature or lever arm, and often trochanteric-pelvic abutment and a Trendelenburg gait with poor hip motion. 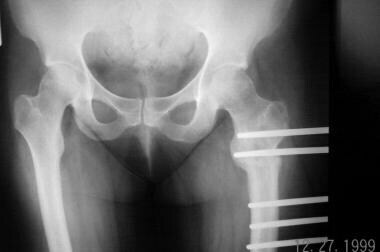 This patient is at an increased risk for the development of hip arthritis. Intertrochanteric osteotomy serves to realign the hip joint, restore normal abductor mechanics, and reestablish equal leg lengths. SCFE is a common fracture variant seen in the adolescent population. In many cases, in-situ pinning of the displaced fracture is indicated, because this reduces the risk of osteonecrosis of the femoral head. If a displaced slipped epiphysis heals in situ, a fracture malunion can result. After remodeling, this malunion is characterized by coxa vara, femoral shortening, and retroversion of the femoral neck with a significant loss of hip motion. A valgus-producing proximal femoral osteotomy can correct the varus and reestablish normal rotation, both of which reorient the femoral head in the acetabulum, offering possible protection from the development of arthritis. This procedure also equalizes limb length and abductor tension, thereby normalizing gait. Patients report limb shortening, hip stiffness, and an inability to abduct the lower extremity, which can be particularly troublesome for women of childbearing age. Pain may be present as well. These patients are at risk for progression of the deformity, fracture of the femoral neck, and joint degeneration. Valgus-producing proximal femoral osteotomy serves to prevent progression of the deformity and the development of a fracture, reestablish a more normal femoral head–acetabular relationship, lengthen the extremity, tension the abductors, and greatly improve hip abduction. Osteonecrosis localized to a small area of the weightbearing portion of the femoral head. Proximal femoral osteotomy was performed and the head was positioned into more valgus. In so doing, the affected portion of the femoral head is rotated away from the weightbearing area. External fixation was selected in this example. Follow-up radiographs demonstrate a well-healed osteotomy with maintenance of the valgus positioning. Proximal femoral osteotomy is a joint-sparing procedure that relies on maintaining the biologic integrity of the femoral head. Preserving the blood supply to the femoral head is of the utmost importance. In adults, the medial femoral circumflex artery is the predominant nutrient vessel supplying the femoral head. 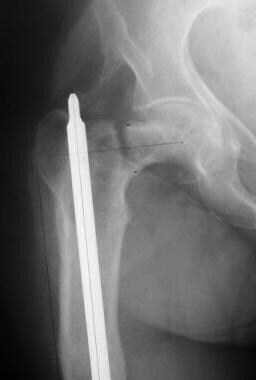 Proximal femoral osteotomy is performed via a lateral approach, reducing the chance of injury to this vessel. Other relevant anatomy includes knowledge of the normal anatomy of the femur. Normal neck-shaft angle is in the range of 124-136°. The center of the femoral head lies at a similar height as the tip of the greater trochanter. A line connecting these 2 points makes an angle of 90° (range 85-95°) with the mechanical axis of the femur. For more information about the relevant anatomy, see Osteology (Bone Anatomy) and Hip Joint Anatomy. When proximal femoral osteotomy is used for the correction of congenital and acquired deformities and repair of hip fracture nonunion, results have been favorable. Hip range of motion, gait, pain, leg-length discrepancy, and patient satisfaction are improved. If arthritis develops, then future joint replacement is often facilitated. Simultaneous femoral osteotomy and total hip arthroplasty is a technically demanding procedure that has yielded acceptable results for complex hip reconstruction with deformity. With regard to the use of proximal femoral osteotomy in the nondeformed hip with osteoarthritis, long-term follow-up reveals that many patients go on to require total hip arthroplasty. Some authors conclude that a place still exists for osteotomy in the treatment of hip osteoarthritis in younger patients. However, many have reported on the increased difficulty and higher complication rates associated with total hip arthroplasty performed in hips that have undergone previous intertrochanteric osteotomy procedures aimed at alleviating arthritic pain. Aydin et al studied the long-term clinical and radiographic results of femoral varus derotation osteotomy in a group of patients with the diagnosis of Legg-Calvé-Perthes disease. A total of 21 hips were evaluated, and the mean duration of postoperative follow-up was 25.1 years. The main determinants of radiographic outcome were (1) age at the time of surgery and (2) preoperative lateral pillar classification, whereas those significantly correlated with progression to degenerative arthritis were (1) preoperative lateral pillar classification and (2) Stulberg group at maturity. Roberts DW, Saglam Y, De La Rocha A, Frasquillo BN, Tulchin-Francis K, Kim HKW. Long-term Outcomes of Operative and Nonoperative Treatment of Congenital Coxa Vara. J Pediatr Orthop. 2018 Apr. 38 (4):193-201. [Medline]. Hadjicostas PT, Thielemann FW. 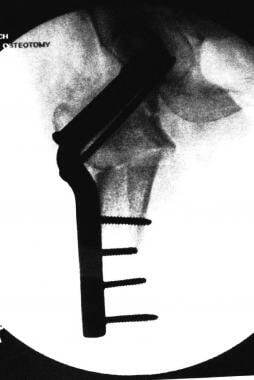 The use of trochanteric slide osteotomy in the treatment of displaced acetabular fractures. Injury. 2008 Aug. 39 (8):907-13. [Medline]. Barr RJ, Santore RF. Osteotomies about the hip--adults. Chapman MW, Szabo RM, Marder R, et al, eds. Chapman's Orthopaedic Surgery. 3rd ed. Philadelphia: Lippincott Williams & Wilkins; 2001. 2723-28. Papagelopoulos PJ, Trousdale RT, Lewallen DG. Total hip arthroplasty with femoral osteotomy for proximal femoral deformity. Clin Orthop Relat Res. 1996 Nov. 322:151-62. [Medline]. Bartonícek J, Skála-Rosenbaum J, Dousa P. Valgus intertrochanteric osteotomy for malunion and nonunion of trochanteric fractures. J Orthop Trauma. 2003 Oct. 17 (9):606-12. [Medline]. Barker KL, Lamb SE, Simpson HR. Recovery of muscle strength and power after limb-lengthening surgery. Arch Phys Med Rehabil. 2010 Mar. 91 (3):384-8. [Medline]. Hammer AJ. Nonunion of subcapital femoral neck fractures. J Orthop Trauma. 1992. 6 (1):73-7. [Medline]. Roshan A, Ram S. The neglected femoral neck fracture in young adults: review of a challenging problem. Clin Med Res. 2008 May. 6 (1):33-9. [Medline]. Yang L, Jing Y, Hong D, Chong-Qi T. Valgus osteotomy combined with intramedullary nail for Shepherd's crook deformity in fibrous dysplasia: 14 femurs with a minimum of 4 years follow-up. Arch Orthop Trauma Surg. 2010 Apr. 130 (4):497-502. [Medline]. Firth GB, Robertson AJ, Schepers A, Fatti L. Developmental dysplasia of the hip: open reduction as a risk factor for substantial osteonecrosis. Clin Orthop Relat Res. 2010 Sep. 468 (9):2485-94. [Medline]. Eastwood DM, de Gheldere A. Clinical examination for developmental dysplasia of the hip in neonates: how to stay out of trouble. BMJ. 2010 May 12. 340:c1965. [Medline]. Varner KE, Incavo SJ, Haynes RJ, Dickson JH. Surgical treatment of developmental hip dislocation in children aged 1 to 3 years: a mean 18-year, 9-month follow-up study. Orthopedics. 2010 Mar. 33 (3):162-166. [Medline]. Aydin BK, Sofu H, Konya MN, Er T, Sahin V. Clinical and radiographic outcomes after femoral varus derotation osteotomy for Legg-Calvé-Perthes disease at 25 years follow-up: what are the determinants of outcome in the long term?. Hip Int. 2016 May 16. 26 (3):301-6. [Medline]. Mayo K, Kuldjanov D. Generic Preoperative Planning for Proximal Femoral Osteotomy in the Treatment of Nonunion of the Femoral Neck. J Orthop Trauma. 2018 Feb. 32 Suppl 1:S46-S54. [Medline]. [Full Text]. Paley D. Principles of Deformity Correction. New York: Springer-Verlag; 2002. 1-18. Kurtz SM, Lau E, Baykal D, Springer BD. Outcomes of Ceramic Bearings After Primary Total Hip Arthroplasty in the Medicare Population. J Arthroplasty. 2017 Mar. 32 (3):743-749. [Medline]. [Full Text]. McGrory BJ, Estok DM 2nd, Harris WH. 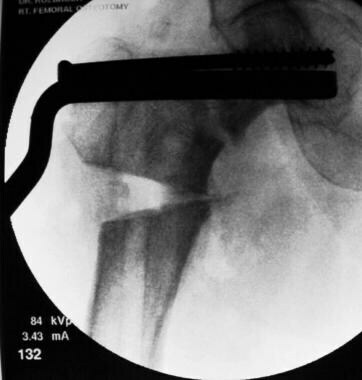 Follow-up of intertrochanteric osteotomy of the hip during a 25-year period. Orthopedics. 1998 Jun. 21 (6):651-3. [Medline]. Yoo JJ, Kim YM, Yoon KS, Koo KH, Song WS, Kim HJ. Alumina-on-alumina total hip arthroplasty. A five-year minimum follow-up study. J Bone Joint Surg Am. 2005 Mar. 87 (3):530-5. [Medline]. Mehra A, Hemmady MV, Hodgkinson JP. Trochanteric non-union--does it influence the rate of revision following primary total hip replacement? A minimum of 15 years follow-up. Surgeon. 2008 Apr. 6 (2):79-82. [Medline]. Seki T, Hasegawa Y, Masui T, Yamaguchi J, Kanoh T, Ishiguro N, et al. Quality of life following femoral osteotomy and total hip arthroplasty for nontraumatic osteonecrosis of the femoral head. J Orthop Sci. 2008 Mar. 13 (2):116-21. [Medline]. Kim HK, da Cunha AM, Browne R, Kim HT, Herring JA. How much varus is optimal with proximal femoral osteotomy to preserve the femoral head in Legg-Calvé-Perthes disease?. J Bone Joint Surg Am. 2011 Feb 16. 93 (4):341-7. [Medline]. Haverkamp D, Marti RK. Intertrochanteric osteotomy combined with acetabular shelfplasty in young patients with severe deformity of the femoral head and secondary osteoarthritis. A long-term follow-up study. J Bone Joint Surg Br. 2005 Jan. 87 (1):25-31. [Medline]. Paliobeis CP, Kanellopoulos AD, Babis GC, Magnissalis EA, Catling JC, Papagelopoulos PJ, et al. Intrinsic passive stiffness of 2 constructs of varus proximal femoral osteotomy: external fixator or blade plate. J Pediatr Orthop. 2010 Jun. 30 (4):351-6. [Medline]. Disclosure: Received consulting fee from Smith and Nephew for consulting; Received royalty from SBi for consulting. Disclosure: Received royalty from small bone innovations for product development; Received consulting fee from Smith and Nephew for speaking and teaching.